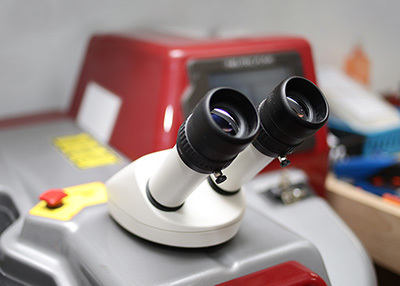 Our laser lab can repair holes and imperfections, re-tip and assemble complicated pieces with surgical precision, and perform detailing close to diamonds and precious pearls at no-risk. We can even repair precious antique jewellery without manipulating fragile parts, removing settings, or destroying its natural patina. Eyeglasses repair is a particular capability of our laser technology. We’ve helped thousands of customers save hundreds of dollars by repairing their broken glasses and sunglasses instead of having to replace them. We can fix your glasses and sunglasses in as little as one hour at our Montreal location or alternatively you can mail your broken glasses to us to be repaired and we’ll mail them back repaired.